Today: See those piles of herbs overflowing at the market? Take them home, and dry them in anticipation of darker days. There's lots of talk, in the summer, about preserving the season's bounty. Make your stone fruit into jams, your cucumbers into pickles. Don't throw away those watermelon rinds! And so on. But your herbs deserve preservation, too. If you've put the time into planting your own, or invested in pricey bundles from the market, you shouldn't let your herbs grow brown and dejected in your crisper drawer. Dry them at home, and you'll have spice jars full of flavor -- much more pungent than the tins that have been sitting on your shelves for a few years -- to last you throughout the winter. Your stews and your braises and your roasted vegetables will thank you for it. More: Another good use for your herbs? Bouquet garni. 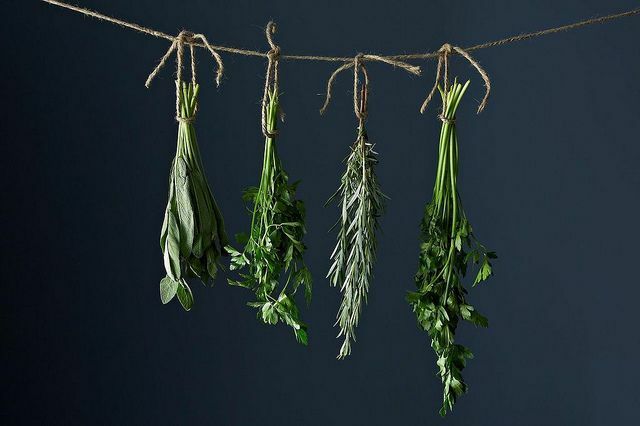 The easiest way to dry your herbs is by hanging them in a warm, dry place. Sturdy, low-moisture herbs take best to this treatment: think sage, thyme, summer savory, dill, bay leaves, oregano, rosemary, and marjoram. Herbs with a higher moisture content (basil, tarragon, lemon balm, and the mints) don't take well to hanging, as they mold easily. Which you don't want. If you're itching for home-dried basil and mint, check out your other options below. First things first: Make sure your herbs are clean (read: dirt- and bug-free). Shake them out, rinse them with water, and then pat them dry with a clean towel. Then, pick off any discolored (brown or yellow) leaves. Find a warm, dry spot where you can hang your herbs to dry. While it might make things prettier, hanging herbs above your stove isn't the best idea: It's not a very dry place. Plus, you don't want any parsley falling into your chocolate mousse. The ideal temperature is between 65° and 70°F. 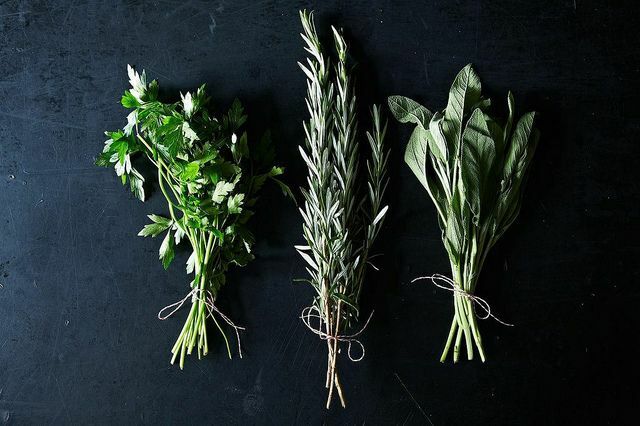 Making sure not to crowd them (you want maximum exposure to air for each leaf), tie your herbs securely with twine or string and hang from a rafter, a cabinet pull, a clothes hanger, or a larger, thicker piece of twine. 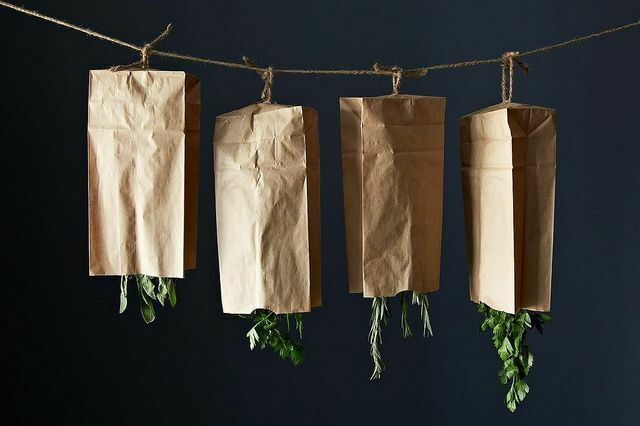 Herbs dried inside will retain better color and flavor, but if you're determined to dry yours outside, here's what you should do: First, make sure you're hanging them somewhere that will protect them from rain. Hang them as you would inside, but protect them from dust, debris, and most bugs by covering them with brown paper sandwich bags. When your neighbors begin asking questions, let them know you're experimenting with outdoor decorating. 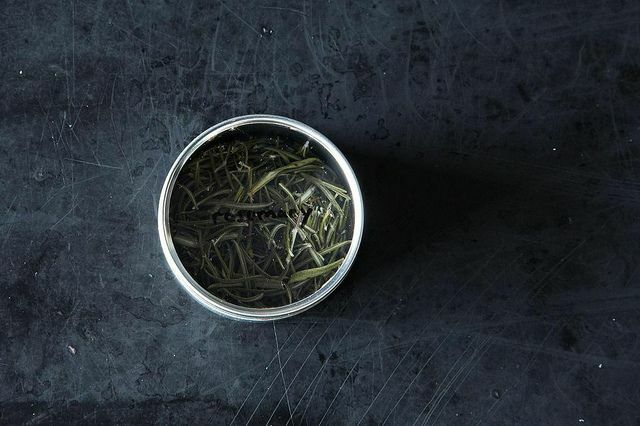 When their leaves crumble between your fingers, your herbs are ready to be taken down. 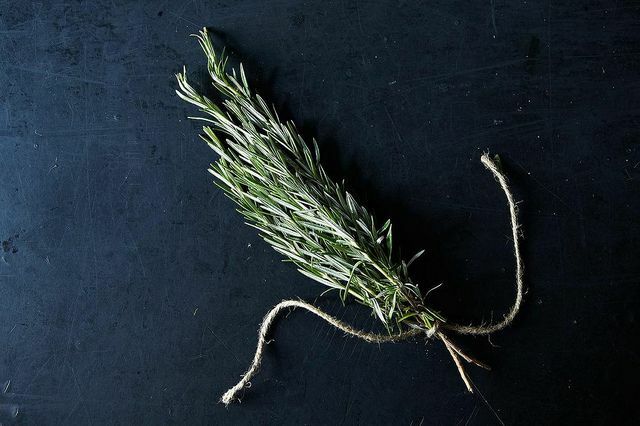 For the woodier herbs, like rosemary, strip the leaves off as you do when they're fresh: assertively, and against the grain. For delicate parsley and thyme, crumble the leaves gently with your fingers. Store them in an airtight container in a cool, dry place. Toss your three jars of stale rosemary to make room for your most recent pantry upgrade. If you have one, you can use a dehydrator to dry any type of herb. Herbs are about the only thing you can dry in a microwave. Remove the leaves from their stem, dry them thoroughly, and place on a paper towel-lined plate. Lay another paper towel over the herbs, and microwave on high for a minute. Repeat for 30 more seconds if necessary. Even herbs like basil -- which don't do well when air-dried -- can be dried in this way. While you're not technically drying them, you can easily preserve your herbs in the freezer. Mrslarkin lays herb leaves on a parchment-lined baking sheet, and then freezes them in individual zip-top bags. 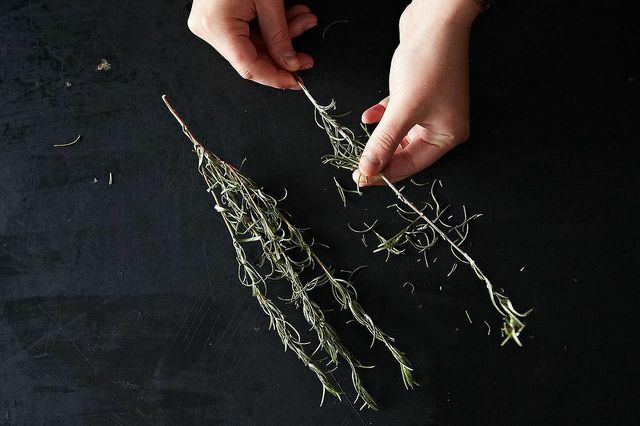 Read about her technique -- and other community members' tips for drying herbs -- in this Hotline thread. 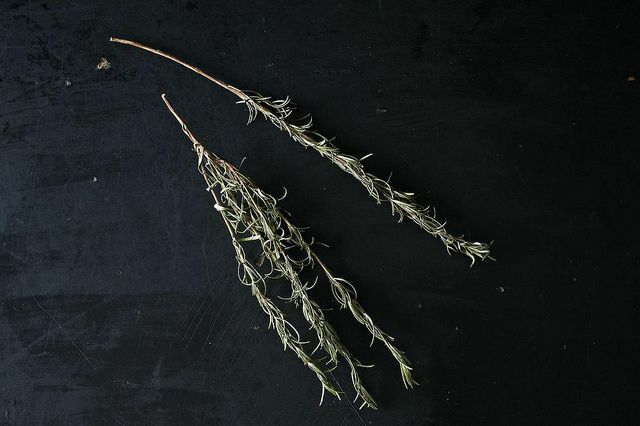 Lastly, remember that dried herbs have a stronger, more concentrated flavor than they did when they were freshly picked. So, when the days get shorter and your herb garden sees its first frost and you begin to reach into your cabinet for your parsley, sage, rosemary, and thyme, use 1/3 to 1/4 the amount that your recipe calls for. How do you dry your herbs? Do you preserve them in other ways? Tell us in the comments! For all types rinse the herbs. Pat dry or wrap small bunches in paper towel, and place them into brown or white paper bags. Fold, staple or paper clip tops closed to keep dust out, and set them in the warmest, driest part of your house. a few months later, put a good movie on your TV and strip off the leaves. Set aside woody stems. Keep your hands inside the bag if it is large enough or use any container large enough to confine scattered leaves. Store in (labelled) glass jars. Keep only enough for the next year and give the rest to friends and family. The twigs will provide a nice aroma in your fireplace or on top of a low charcoal fire. Can I use the steps for drying the bay leaf? Will the bay leaf be flat instead of twirling? should i treat fennel fronds in the same manner as dill? You know, I've never read about anyone drying fennel fronds before -- might be a good question for the hotline! Thanks for your tip.. I will try it!! Finally...a way to keep my husband's parsley from going to waste! Great information and pretty pictures. Thanks! I hang mine in windowsills: though it's super humid here in Hawaii, it's also very breezy and this makes herbs dry swiftly and deliciously! This is so great because the only herbs I can find around me (that actually smell great and seem to be of good quality) come in large bunches and I can never use them up in time (or in the words of SJ, thyme). Thanks, Marian! I find that putting herbs in a brown paper bag and then in the crisper drawer in the fridge works really well. Good to know -- thanks! Any thoughts on drying lemon verbena? I think lemon verbena has a pretty high moisture content; I would try drying in the microwave! Or freezing, or bribing a friend with a dehydrator. Thank you for this! I always get anxious about the large quantities of cilantro and basil browning in my fridge. After I've made 4 kinds of pesto and garnished 10 different dishes with absurd quantities of herbs, I'm usually all out of things to do. I can't wait to try this. Also, beautiful pictures.